This was an unusual week for me. On March 19, 21, 22, I made presentations on Mercy’s technology integration at major venues. Two of the presentations concerned our iPad professional development professional program. I had a packed room at the 2013 MACUL Conference, yesterday. On Tuesday, I presented a webinar on the same subject to 167 viewers. The interest had little to do with me, personally. Instead it reflected how far ahead of the game Mercy stands thanks to its many years with 1:1 computing. The iPad is “hot” and lots of schools are jumping in thanks to the price point. However, we have been able to hit the ground running insofar as instructional integration goes. Of course, it has been a challenge, but unlike many schools we could leverage our long commitment to technology in order to prep and support our teachers. Consequently, while other school communities are puzzling over the iPad, the device is already integral to Mercy’s instructional program. 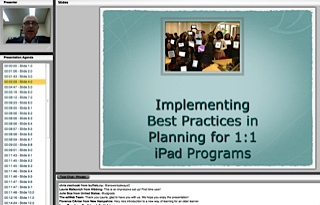 My webinar which was presented on edWeb.net, was called, “Implementing Best Practices in Planning 1:1 iPad Programs”. Our good friend Lucy Gray served as host and moderator. This entry was posted in Mercy 2.0, Professional Development. Bookmark the permalink.